We are now in California and there is still some desert to cross. The heat of the Mojave Desert is very noticeable. Gary tells us that a cold front is passing over so it is only about 105°F – last week it peaked at 128°F. Even so, it is uncomfortable to ride in and dangerous if we start to suffer from hyperthermia. We are fortunate in that we have cool vests. Bill bought one in the Harley dealership the day before. Others don’t have this luxury and Gary advises them to ride in the long-sleeved white t-shirts we bought back in Winslow. Though there is a reluctance to ride without proper protective clothing, Gary tells us that it is better to keep cool, stay alert and not have an accident than to overheat, pass out and have an accident. It’s so easy to feel sleepy in the heat and that’s where the CamelBaks also help – taking a sip of ice-cold water really helps the concentration. We take a stop at a café/shop where we have a coffee. In the meantime, our cool vests are soaking in the ice chest in the back of the support truck. Our cool vests also have sleeves meaning that our arms are cooled as well. Françoise and I look strange as we put on our vests and then put our armoured mesh jackets over the top. The others look cool in t-shirts but we look hot fully togged up. In fact, we are quite comfortable. Wearing the cool vest is just like air-conditioning in that our bodies and arms stay cool. They work even better in the desert than they did in Missouri because the desert is so much drier and so the evaporation, and thus cooling effect, is more intense. We keep them on even when walking around and they provide a cooling effect. After leaving the café we see the EagleRider party stopped in the road. I first thought that somebody might have had an accident but it turned out that they stopped for photographs with the Route 66 signs painted on the road. We stop further up the road for our shots at a location where we had greater visibility of approaching traffic. Since the road was quiet (maybe a dozen vehicles an hour might go by), we were able to set up a recreation of the Wild Hogs poster shot. We took a number of other photographs while we were there. In the distance we saw EagleRider making their way towards us. 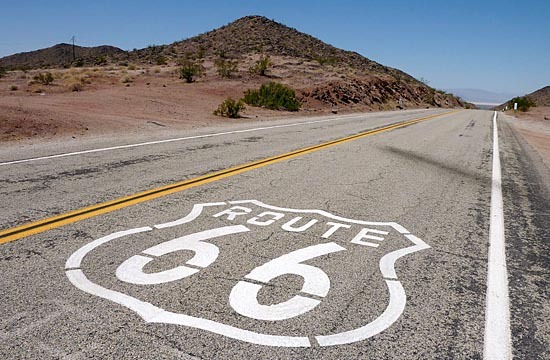 I fancied filming bikes riding over the Route 66 road marking. Niell, Bill and Gary stayed by the road to greet them as they rode past. We then took off on our own to ride to Amboy. We couldn’t miss Amboy as it was about the only place for miles and was marked by a large Roy’s Café sign. We sheltered in the shade, drank more water, took photographs and visited the shop. Roy’s Café shut down many years ago and is still closed as a café but that might change in the future. It was purchased by the owner of the Route 66 Museum in San Bernardino with the intention of restoring everything to its former grandeur. At present, only the shop is open for a small selection of souvenirs. In fact, it was the whole of Amboy that was purchased. Amboy is a small town with about ten buildings and twenty residents. It even boasts a post office! We were told about the nearby volcano (Amboy Crater) and we passed quantities of black rock on the way out which we assume to be old lava flows. The crater itself is not particularly large at 250 feet high and 1500 feet in diameter. The most recent eruption was about 10,000 years ago. We stop at another Dairy Queen for a welcome ice-cream before finding another diner along the way for a late lunch. It was a straight run into Victorville after that. That evening we had a party in Gary’s hotel room where we watched “The F Word”, an episode of South Park where the residents call Harley riders fags. Gary also surprised Pat with a birthday cake. It was a fantastic cake (Gary also trained as a chef) and we all wondered how Gary had managed to produce it in the short time between arriving at the hotel and meeting up with him in his room. It was a good relaxing evening and slightly sad since we knew that our trip was coming to an end.